The CEO has a role that we can’t assume everyone fully understands. 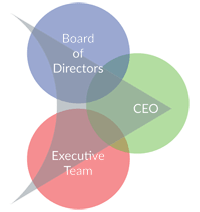 Many imagine the CEO’s role as leading the Executive Team. While that is true, his/her role is more complex. It involves being an effective member of the Board while being an outstanding leader of the team and of the overall organization. These responsibilities, combined with being accountable for creating an organization’s culture, mean that the leadership demands for a CEO are great. A CEO must be mindful of employees, investors, shareholders, customers, partners, prospects and the communities his/her decisions will affect as a result of how he/she communicates and makes decisions. All major athletes and virtuosos have trainers to help them perfect their performance or re-align the gifts that they already have. As a leader, who do you “work out” with about your leadership effectiveness? Do you have someone with whom you openly discuss ideas to bring forth the best in your leadership? Do you reflect about your leadership skills? How do you practice letting go of unhealthy behaviors and embracing the right ones for you? What do you do to align your mind, heart and spirit to “do the right thing”? How do you reflect on your effectiveness as a leader that others can aspire to emulate? As the Executive Team leader and Board director, the CEO faces exciting challenges, but with incredible pressure. A CEO is presented with continuous input, often overwhelming data, limited relevant information, and a constant demand for quick decisions. And in making these decisions, CEOs also have to balance the human and business aspects of each situation. It’s critical for a CEO to have an ally to exchange ideas with – someone he or she can talk with who is objective, non-judgmental, and has no hidden agendas. Whether a CEO is in need of becoming more effective as a leader, contemplating a major business expansion, a move to a new company, taking on an unfamiliar new role, or a major career transition, Johanne Bouchard can be with you as you make your journey. Our Western culture and education may promote independence and self-sufficiency, yet all of us have experienced the clarifying power of a totally open and trusting dialogue– the release and discovery that comes from deep conversation with someone who has no ulterior motives and makes no demands on you. Unfortunately, the CEO position makes it difficult to have such dialogues in the work environment. Most often there is no one in the CEO’s work environment in whom they can truly or fairly confide without risking added pressure or conflicts of interest. They need a trusted resource. Johanne Bouchard is that resource– a trusted and trustworthy confidante.